Rise, Ye Sea Slugs! 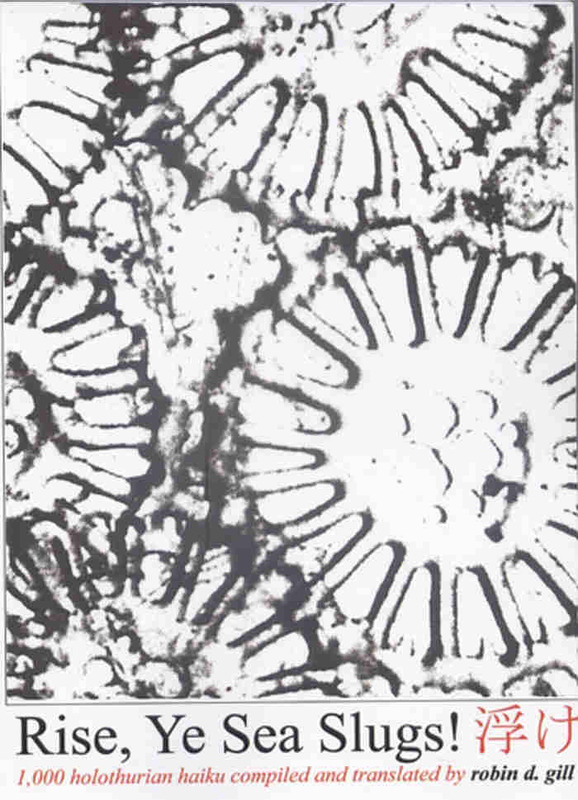 by robin d. gill -- a sample of the preface and foreford -- ossicle background = dr mike reich. A new angle on the sea SLUG vs. sea CUKE name problem Is the author sea slug/cucumber OBSESSED? Visiting the West, one is struck by the absence of the sea cucumber. It is not that the holothurian itself is absent. With 1,400 odd species found around the globe, sea cucumbers are cosmopolitan. (ed. note: The popular and poetically necessary term “sea slug,” used in this book, is misleading, for the scientist and skin-diver’s “sea slug” is the nudibranch, a shell-less mollusk with colorful tentacle-like projections on its back.). Nor is there a lack of scientific interest in this plain-looking relative of the sea urchin and starfish. The sea cucumber’s unique physiology – how it quickly hardens or softens itself, how it throws away organs and later re-grows them, how it survives without a brain – fascinates Occidental researchers, as it does ours, in Japan. Its various medicinal uses are achieving worldwide attention and, with some species endangered from over-fishing and poaching, non-Japanese marine biologists, ecologists and diving enthusiasts are doing much to help publicize and protect and grow this creeping vacuum-cleaner so vital to the health of the sea floor. No, what is missing outside of Japan is not information nor concern for the sea cucumber, it is something more subtle, something we Japanese take for granted: the traditional sea cucumber, the holothurian as culture. The high level of holothurian consciousness in Japan is further reflected in the quality and quantity of the poems translated in this book and in the contemporary publishing world, where mass-market paperbacks largely or wholly about sea cucumbers boasting titles that translate as The Sea Cucumber’s Eye, The Sea Cucumber and the Sea Urchin, The Dolphin, Sea Cucumber and Sea People, and Sea Cucumber Reader are not only printed but reprinted, this in marked contrast to the situation in the English language world, where the only "books" on our subject are pamphlets about fishery issues (the exception is a novel named for, but not primarily about namako – by a Japanese-American – and a book of poetry called The Sea Cucumber, but containing only a single line about them!). If we add Japanese books new and old which use a trait of the namako as an allegory but do not concern the sea cucumber itself, such as the early twentieth century Droll Haiku: The Sea Cucumber’s Tongue, mid-twentieth century science essay The Sea Cucumber’s Bones, and a popular author’s recent best seller The Sea Cucumber Watching the Moon, the gap is even more obvious. Thus chastened, for almost a millennium the Japanese sea cucumber held its silence. You cannot find any mention of it in old poetic forms such as waka or renga. It took the emergence of the hokku (the first verse in traditional linked-verse) as an independent short poem, that is to say, the development of what we now call “haiku,” to finally give the namako back its voice. With the publication of this book by the American writer and translator Robin D. Gill, a.k.a. “keigu,” the Japanese sea cucumber will make itself heard around the world. And, translated back into Japanese, which it surely will be, a new generation of readers will, many for the first time, hear the voice of the traditional sea cucumber, the namako of old Edo's poets, a confused and melancholy but always witty character, who sometimes has great trouble making himself heard over the electronic din of today's popular culture. My twenty-book selection of Edo era poetry, In Praise of Olde Haiku, has only two hundred themes. The namako, or “sea slug” – patience, biologists, an explanation for the wrong name is in the next paragraph! – is one of them, despite the fact that it barely makes the top five-hundred themes included in Japanese saijiki, or haiku almanacs. Why, then, include it? And why expand it further in this spin-off? Because sea slug offers a unique challenge. Namako is not only a winter theme. It is a three-dimensional litmus test. To some poets it is food. To some it is a grotesque creature. To others it is chaos embodied. 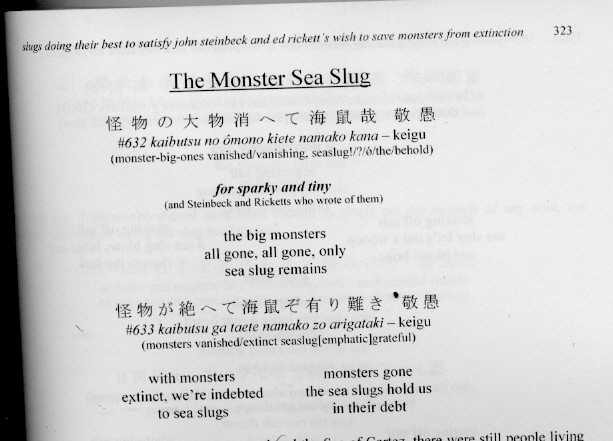 Unlike most of the main haiku themes, the sea slug is freshly invented, for it did not grace classical Japanese poetry. This may owe something to its low cultural visibility over the waka-writing centuries (900-1500), something that changed in the Tokugawa era (1603-1867) when the dried slug (trepang) became the mainstay of Japan's trade with China. But the general consensus is that this “mere blob of fleshy matter” (Blyth: Hv4)) did not appeal to the haute culture of the waka and renga poets because it was, in a word, gross. For the same reason, it offered haikai poets who wrote what came to be called haiku as well as poems that were far too risque for the current canon) a good chance to prove how different they were, to show off their a-lyrical stuff. 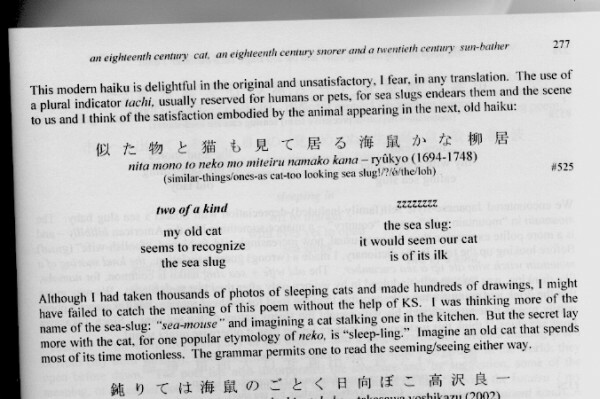 Finally, it offers me a chance to prove to readers not fluent in Japanese, that even a subject this foreign to their literary tradition – “the winter kigo [seasonal word/theme] ‘sea slugs’ does not resonate for us,” writes one American haiku association – may be interesting. Each chapter of RISE, YE SEA SLUGS! focuses on a different type of sea cucumber, not a different biological species, but a different semiological species. In biology, the line between species is not always solid. Even with DNA called in to arbitrate, arbitrary lines, i.e. definitions, have to be made. The same thing is true with respect to organizing a poetic typology. Moreover, I had to do this work completely de novo, with no Linnaean system, indeed no prior system at all, to assist me. My modus operandi was simple. I collected every old haiku and senryu on the sea cucumber I could – and tried to divide them thematically. I wavered back and forth as I made new finds. It was something like playing cards, where a new draw might make you decide to go for a full-house rather than a straight. In the end, I had a good hand. As the Table of Content shows, I managed to invent no less than twenty-one semiological species – metaphorical groupings, if you prefer – and, as the text will show, many more sub-species, scores of which have been compiled into a large extra chapter of Sundry Slugs. If the range of individual difference for a given trait in a species can be listed in serial or drawn as a simple distribution curve, even a complex graph of overlapping curves – or for that matter, a tree – cannot show the convoluted relationship of many species, sub-species and their various traits. That is to say, my chapters and the haiku within them not only overlap each other, but do so in ways that defy proper narrative. The overall relationship can only be grasped at a glance by three-dimensional modeling, or the next best thing, overlapping Venn diagrams, a sample of which, I plan to offer (below) in the best tradition of Laurence Sterne. Arranging such material in a serial narrative was, to borrow holothurian expert and curator Philip Lambert's fine pun, truly a taxing problem! I hope that even if the ride is occasionally bumpy, good readers from every ilk of life will still find themselves transported by my sea slug serenade. More another day. Now I must put in hypertext and get this website up! All of this a first for me! SCREEN-SHOTS OF LARGER CLUSTERS OF POETRY FOUND HERE!